On Grief and Grieving | From Emotional Hurt to Emotional Health! January 23, 2012 Marcus Mottley, Ph.D. The last two days were quite unusual for me. I had a talk with not one, not two… but three friends who are all experiencing the same thing: grief. That by itself is unusual. But even more unusual is the fact that all of them are grieving the loss of two close family members. As a Clinical Psychologist when faced with clients who are grieving the loss of loved ones, I normally move to the professional side of me that is focused on counseling, educating, inspiring, teaching, coaching, influencing and motivating clients how to deal effectively with their grief. I teach them cognitive, emotive, behavioral and process oriented strategies and techniques that are geared to help them to transition through the grief process and stages. This presents a struggle since it is difficult, particularly in these situations to be a friend and psychologist at the same time. From the professional perspective – there may be an issue of ethics… I cannot serve a dual role. I am not supposed to serve as friend and clinician. From the personal perspective there is also a struggle… I cannot see my friends hurt emotionally and not help. What do I do? Well… having gone through this type of struggle as long as I have been a clinician, I have developed a few strategies that helps me to help them. I refer them to some of the same resources that I useto prepare myself to help others. Some of the most powerful resources that are available to help people who are grieving are the writings of Elisabeth Kubler-Ross. Her last book, On Grief and Grieving, penned with David Kessler just before her death in 2004 cannot be described as anything less than a treasure for those who are grieving. 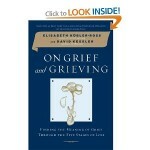 On Grief and Grieving gives readers sage advice and counseling in abundance. For example, the authors contend that, “If you do not take the time to grieve, you cannot find a future in which loss is remembered and honored without pain.” This is powerful and exhorts people to follow the clear steps and process that they outline in the book. These steps are denial, anger, bargaining, depression, and acceptance. On Grief and Grieving applies these stages to the grieving process and weaves together theory, inspiration, and practical advice, including sections on sadness, hauntings, dreams, isolation, and healing. For those who are grieving, I lovingly suggest that you get On Grief and Grieving here.